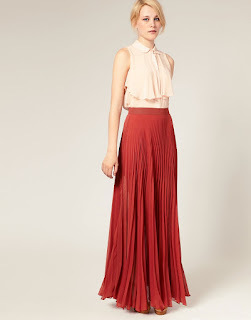 The pleated skirt has always been a very elegant staple piece in the past. It's currently become popular once more with even more versatility. I have begun to notice more dresses with a pleated skirt or a pleated skirt being worn with a crew or v-neck shirt for a more casual appeal. These seem to be paired with some flats, trainers or pumps. Lately, I've become so fascinated with it as I browse through pin interest, high end and high street websites and even some magazines. I currently own a floor-length pleated skirt made with chiffon material in the colour orange and I love it, I got it for quite a steal. Despite having it for a few years now it's something that I have trouble parting with whenever I am decluttering my wardrobe .I have worn it to weddings with a white lace top and a blazer or casually with a black vest and some sandals to go out for a meal on a summers day. Whatever the theme of the day a pleated skirt is something that can be paired with many types of shoes or tops. 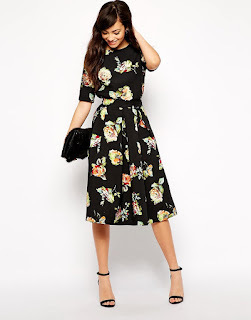 I'll leave you with some pieces I have liked from the high street.